국제앰네스티는 중국과 러시아의 무기 공급이 다르푸르 지역의 중대한 인권침해 행위를 더욱 부추기고 있다고 9일 밝혔다. 최근 수단의 상황은 실효성이 없는 현행 유엔 무기금수조치를 강화하고 각국 정부가 효과적인 무기거래조약 체결에 대한 합의를 도출해내야 할 긴급한 필요성을 더욱 부각시키고 있다. 국제앰네스티의 새로운 보고서 「수단, 끝이 없는 다르푸르 분쟁」은 수출된 무기가 다르푸르 지역의 민간인들을 대상으로 사용되고 있다는 강력한 증거가 있음에도 중국, 러시아, 벨라루스 등의 국가들이 수단에 지속적으로 무기 및 군수품을 공급하고 있는 실태에 대해 상세히 기술하고 있다. 이들이 공급하는 무기 및 군수품에는 상당량의 탄약과 무장 헬리콥터, 공격기, 공대지 로켓 및 장갑차 등이 포함된다. 지난 2011년 수단 정부군과 민병대가 자가와 부족에 가한 인종차별적 공격으로 동부 다르푸르에서 발생한 실향민의 수는 약 7만여명에 이르는 것으로 추정된다. 국제앰네스티 군사∙경찰 전문가인 브라이언 우드는 “중국과 러시아는 수출된 무기의 상당수가 다르푸르 지역에서 인권침해를 자행하는 데 쓰일 가능성이 높다는 점을 충분히 알고 있음에도 수단 정부에 무기를 공급하고 있다”라며 “다르푸르 분쟁은 해외로부터의 지속적인 무기 공급으로 인해 계속되고 있다. 더욱 중대한 인권침해를 막기 위해서는 수단을 대상으로 한 모든 국제 무기 이전을 즉시 중단하고 유엔 무기금수조치의 부과 대상을 수단 전역으로 확대해야 한다”라고 말했다. 다음 주 뉴욕 유엔본부에서는 유엔 안전보장이사회가 기존에 부과된 대수단 제재조치를 재검토하기 위해 소집될 예정이다. 세계 각국 정부들 또한 무기거래조약 체결을 놓고 중대한 논의를 재개할 예정이다. 효과적인 무기거래조약이 체결되면 무기가 중대한 인권침해 및 전쟁범죄를 저지르거나 이를 조장하게 하는 데 이용될 실질적 위험이 있는 경우 각국 정부에 무기 이전을 중단시킬 의무가 부과될 것이다. 브라이언 우드는 “세계 각국이 인권존중에 대해 구체적인 조항을 담은 강력한 무기거래조약을 체결하지 않는 한, 유엔의 무기금수조치는 계속해서 무시당할 것이며, 수백만에 이르는 사람들이 오늘 다르푸르의 사람들과 같이 무책임한 무기거래로 인한 고통을 받게 될 것”이라고 지적했다. 수단에 공급된 무기는 다르푸르에서 수단 정부군(SAF)이 직접 사용하거나 민중방위군(PDF) 등의 정부 지원을 받는 민병대에 공급된다. 민중방위군 소속 병사들은 공식적으로 수단군 군용차량에 탑승하는 등 수단군으로부터 지휘를 받고 장비를 지급 받는다. 다르푸르의 정부군과 수단 보안기관, 정부 지원 민병대 등은 중국산 소형무기 탄약을 사용하고 있다. 지난 2011년 12월 1일에는 분쟁 지역 실향민들이 모인 잠잠 캠프를 수단 보안군이 급습해 약탈하면서 한 명이 총에 맞아 숨지고 여섯 명이 크게 다치는 사건이 발생하기도 했다. 목격자들은 급습 이후 발견된 탄약에 ‘41’과 ‘71’이라는 중국산 제조 코드와 함께 (20)06, (20)08이라는 제조일자가 표기되어 있었다고 전했다. 이는 탄약이 유엔 무기금수조치 부과 이후 이전된 것이라는 사실을 나타낸다. 국제앰네스티는 2011년 남부 코르도판 지역에서도 중국산 제조 코드가 새겨진 2010년산 탄약이 목격되었다는 정보를 입수했다. 2011년 동부 다르푸르에서 벌어졌던 교전에서는 수단 정부군이 수호이-25 지상 공격용 항공기, Mi-24 무장 헬기, 사실상 폭격기로도 사용된 안토노프 수송기 등을 동원해 반복적으로 군사 표적과 민간인 모두에게 반복적으로 공습을 가했다. 국제앰네스티는 수단 정부가 2007년에서 2009년에 걸쳐 Mi-24 무장 헬기 36대를 입수한 것으로 보고 있다. 다르푸르 교전은 러시아 정부의 지속적인 Mi-24 공급으로 계속될 수 있었던 것이다. 2011년 5월 러시아 상트페테르부르크 공항에서 촬영된 사진을 보면 신형 Mi-24P 무장 헬기들에 수단군 마크가 새겨져 있는 것을 확인할 수 있는데 이는 명백히 수단으로 수출 대기 중인 것으로 보인다. 국제앰네스티는 수단군이 2011년 다르푸르와 그 외 지역을 공습하면서 수 차례 공대지로켓을 사용했다는 증거를 입수했다. 이 로켓들은 다수의 구소련 국가에서 생산됐으며 Mi-24 무장 헬기와 Su-25 지상 공격용 항공기 등에 탑재되는 무기와 같은 종류다. 수단 정부는 벨라루스와 러시아로부터 상당한 수의 장갑차를 지속적으로 수입하고 있다. 국제앰네스티는 2011년 동부 다르푸르에서 수단군과 민중방위군의 군사 작전에 BTR-80A 장갑차와 SAF의 랜드크루저 차량에 장착된 다연장로켓발사대가 사용되었던 상황을 자세히 기록한 바 있다. 국제앰네스티는 유엔 안전보장이사회에 다음과 같은 사항을 촉구한다. • 현행 유엔 무기금수조치의 부과 지역을 즉시 수단 전역으로 확대해 다르푸르 지역 분쟁 당사자들에게 제공되는 무기 및 관련 물자 공급을 차단하라. 이러한 금수조치는 충분한 지원을 받고 유엔 안전보장이사회 제재위원회에 정기적으로 보고하는 유엔 전문가패널의 지속적인 감시 하에 있어야 한다. 전문가패널은 국제적인 조사를 수행해야 하며 금수조치가 준수될 수 있도록 수단으로 들어오는 주요 항구를 정기적으로 감시해야 한다. • 수단 정부에 현재 다르푸르에 부과된 유엔 무기금수조치에 성실히 따를 것을 요청하라. 여기에는 모든 군사비행을 중단할 것과 다르푸르로 군사장비 및 군수품을 반입할 경우 유엔 안전보장이사회의 사전허가를 받을 것 등이 포함된다. 국제앰네스티는 세계 각국에 다음과 같은 사항을 포함한 효과적인 무기거래조약을 체결할 것을 촉구한다. Arms sales from China and Russia are fuelling serious human rights violations in Darfur, Amnesty International said today. These arms transfers highlight the urgent need to strengthen the existing ineffectual UN arms embargo and for governments to agree an effective Arms Trade Treaty. A briefing, Sudan: No end to the conflict in Darfur, documents how China, Russia, and Belarus continue to supply weapons and munitions to Sudan despite compelling evidence that the arms will be used against civilians in Darfur. Exports include supplying significant quantities of ammunition, helicopter gunships, attack aircrafts, air-to-ground rockets and armoured vehicles. “China and Russia are selling arms to the Government of Sudan in the full knowledge that many of them are likely to end up being used to commit human rights violations in Darfur,” said Brian Wood an expert on military and policing for Amnesty International. Next week, at the UN in New York, the Security Council will again consider the existing Sudan sanctions. Governments will also resume crucial talks on a future Arms Trade Treaty. An effective treaty would compel governments to stop transfers where there is a substantial risk the arms will be used to commit or facilitate serious human rights violations or war crimes. “Until governments agree a strong Arms Trade Treaty with specific rules to respect human rights, UN arms embargoes will continue to be flouted and millions of people will continue to suffer the consequences of irresponsible arms transfers, as they do in Darfur,” said Brian Wood. Arms supplied to the Government of Sudan are used in Darfur both directly by the Sudan Armed Forces (SAF); and government-backed militia including the Popular Defence Force (PDF). The PDF formally commanded and equipped by SAF operate alongside them, including by being deployed on SAF vehicles. One attack, on 1 December 2011, at the Zam Zam camp for people displaced by the conflict, saw Sudanese security forces carry out a looting raid during which one man was shot dead and six other people were seriously injured. Witnesses reported finding ammunition following the raid bearing Chinese ‘41’ and ‘71’ manufacture codes, and (20)06 and (20)08 manufacture dates indicating that it was transferred to Darfur after the imposition of the UN arms embargo. Amnesty International has discovered that 2010-manufactured ammunition with Chinese manufacturing codes have also been observed in Southern Kordofan during 2011. 2011 fighting in eastern Darfur saw a repeated pattern of aerial attacks on both military and civilian targets using SAF Sukhoi-25 ground-attack aircraft, Mi-24 helicopter gunships, and Antonov transport aircraft used as rudimentary but effective bombers. A photograph taken at St Petersburg airport in the Russian Federation in May 2011 shows a new Mi-24P helicopter gunship painted in SAF markings apparently awaiting export to Sudan. Sudan has continued to import a significant number of armoured vehicles from Belarus and the Russian Federation. 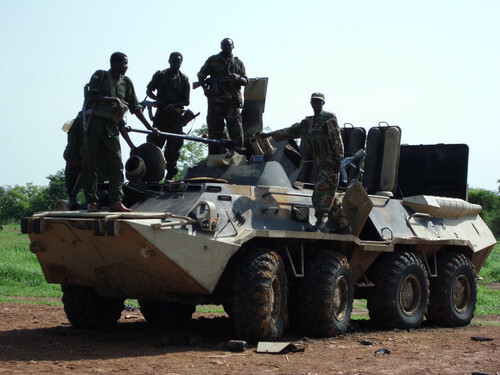 Amnesty International has documented the use of both BTR-80A armored vehicles and multiple-rocket launchers mounted on Land Cruiser-type vehicles in SAF and SAF/PDF operations in eastern Darfur in the first half of 2011. • Demand that the government of Sudan complies with the existing UN arms embargo on Darfur, including by stopping all offensive military flights and seeking prior authorization from the UN Security Council Sanctions Committee to move military equipment and supplies into Darfur. • robust standards for implementation and enforcement including national authorization and licensing systems.